One of the places in South Korea that I was dreaming to visit is Nami Island. When I went on a solo trip to South Korea in 2014, I intentionally did not visit this because I was saving it for someone special. A beautiful island known for being a location for Korean Dramas including Winter Sonata, I thought it would be lovely to go here with someone that I love. But destiny is so elusive. Four years later, I still haven’t found that someone yet. I think it’s a sign telling me not to wait anymore. Just go to South Korea and enjoy the picturesque Nami Island whether I’ll be alone or whoever I’ll be with. So when an airline offered a promo fare a few months ago for a flight from Manila to Seoul, I grabbed the chance and booked that plane ticket right away. My first two visits to South Korea were all solo trips. I didn’t want to travel solo again for my third time so I asked my brother to come with me. He hasn’t been to South Korea but he has already a tourist visa ready. I knew he won’t hesitate so he excitedly joined me. Then I realized, we haven’t really traveled together yet as in just the two of us. So this trip is special. Now, I can say I fulfilled my word to visit Nami Island with someone who I love. Well, with my brother. 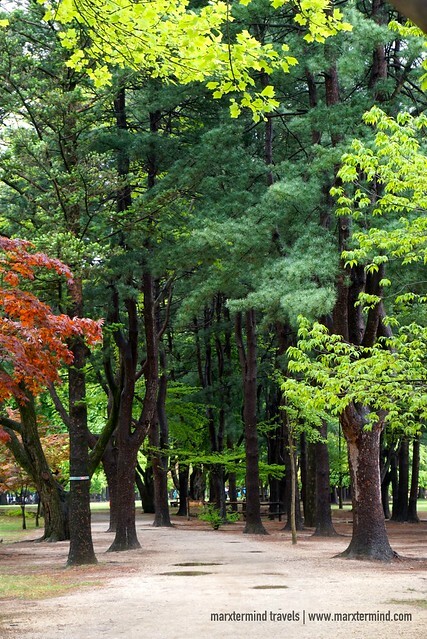 Listed as one of the top attractions in South Korea, Nami Island is a great destination to visit. This half-moon shaped island has breathtaking views and perfect scenery. Walking around is a dream of its own. 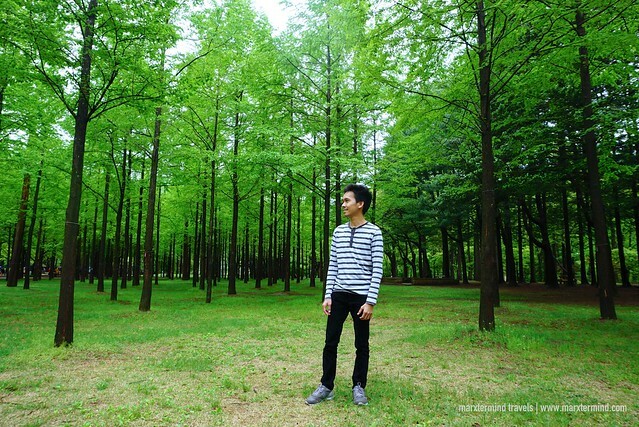 It has a sanctuary of vast, tall trees that has become witness of the changing seasons of South Korea. 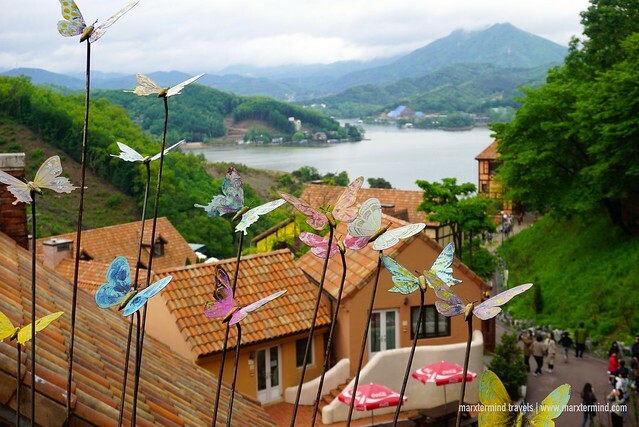 Nami Island is also a place of history and home to several galleries. My brother and I only had a weekend to spend. 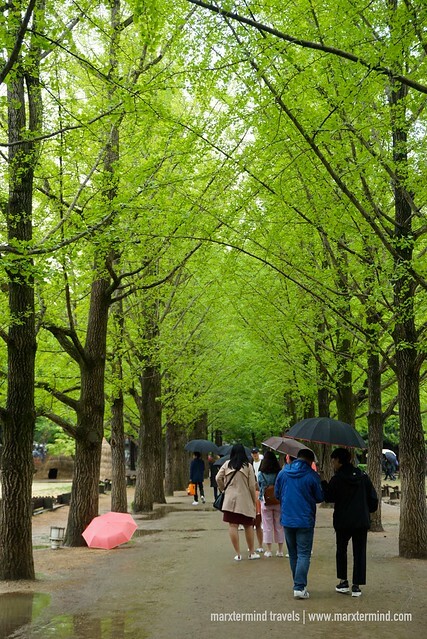 To make it convenient for us, we decided to go on a day trip to Nami Island by booking a tour from Klook. Klook is a technology company that offers tours and attraction tickets at the best prices. By visiting its website or mobile app, finding activities and things to do has been made easy. I know Klook for a while already. In fact, I was able to book a tour and buy a ticket here when my friend and I went to Beijing last December. It’s easy to use and searching for activities is very convenient. It’s like a one stop shop for all the activities you want to experience in your choice of destination. Honestly, Klook made me not to prepare comprehensive itineraries for my trips anymore. With few clicks or taps, I could simply select and book my desired activity for my trip already. 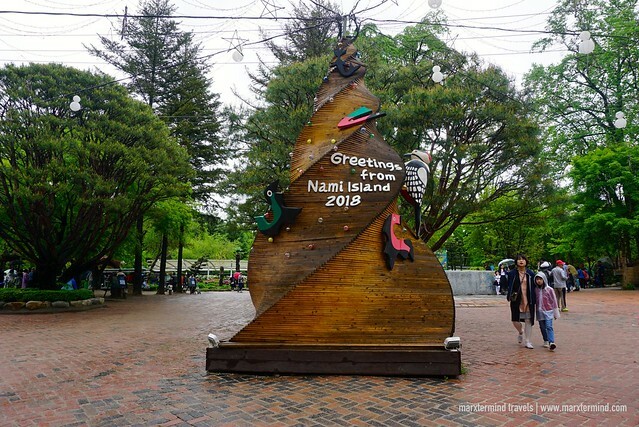 There are numbers of interesting day trip activity available in Klook for Nami Island. My brother and I wanted to make the most out of our vacation in South Korea. 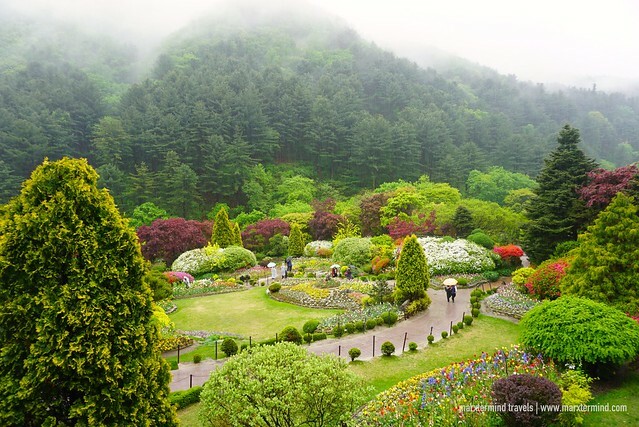 Gladly, Klook has this Nami Island, Petite France, Gapyeong Rail Bike and Garden of Morning Calm Day Tour. All these four attractions in one day. I reckoned it was the most ideal day tour to choose. So I booked this tour and instantly got the confirmation and voucher details in my email. On the day of the tour, my brother and I went to the meeting place and I simply showed the voucher from my mobile. But I still prepared a printout of it, just in case. Very easy and convenient, isn’t it? This full day tour is a visit to four of South Korea’s most popular attractions outside of Seoul. It’s a convenient day trip complete with transfers, lunch and admission tickets. The meet up place for the tour is at Myeongdong Station. When we arrived, we easily recognized the vehicle that we would be using since it has a Klook name on it. We approached the driver and he asked for our names. I showed him the voucher. After checking his list, he told us to enter the car. I was surprised that we’ll be using a car and not a shuttle nor a bus for this tour. Surprisingly, this tour is dedicated for four persons only. Amazing! We haven’t begun yet but I already started loving this tour that we booked. We had a comfortable ride and a semi-private tour. It was around 8:30 AM when we left Seoul. Gapyeong is about 45 minutes to an hour travel outside the capital city. 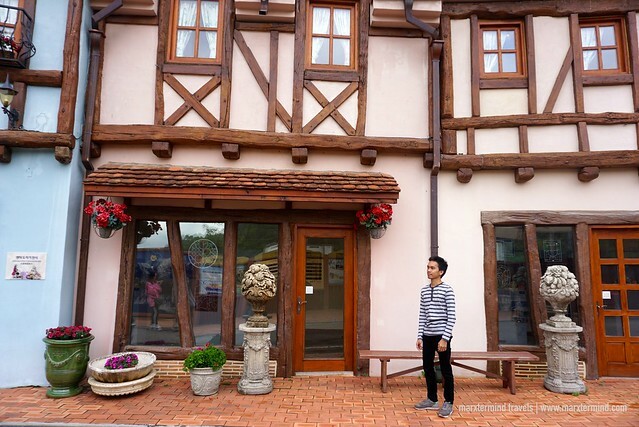 With a day to explore four attractions in this area, here’s how our day tour with Klook went. The Garden of Morning Calm was our first destination. 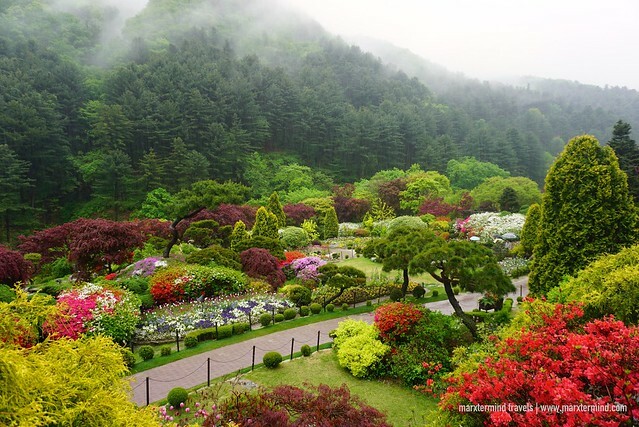 It is a 30,000 square meter garden filled with beautiful plants and flowers. 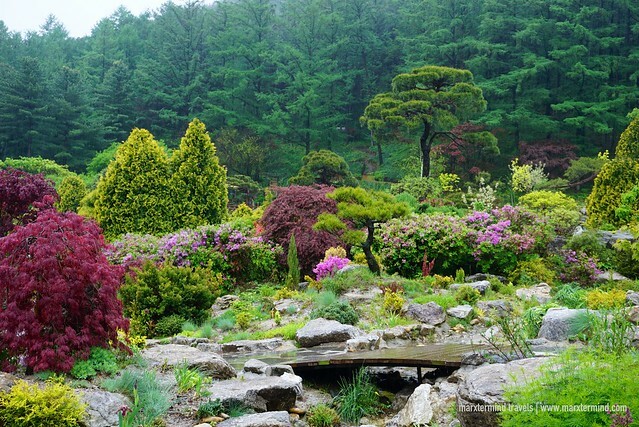 It was founded by Professor Han Sang-kyung with a vision to set up a world-class garden that embraces the natural beauty of South Korea. Now it has more than 20 themed sections that houses about 5,000 kinds of plants. The Garden of Morning Calm also offers wonderful landscape and scenic walkways. It was raining during the tour. But that didn’t stop our group to walk around and take beautiful photos of this huge attraction. Our driver gave us an hour and a half to enjoy the place. The garden is massive. As much as we wanted to visit all the themed sections, we weren’t able to. But with the help of the map that we got from the ticket office, my brother and I were able to visit the most meaningful and popular ones. Some of my favorites are Rose of Sharon Garden, Sunken Garden, Road to Heaven, Pond Garden and Moonlight Garden. The Garden of Morning Calm also hold exhibitions of different flowers and variety of festivals. Depending on the season, some of the sections of the garden transform into a unique and magnificent display. It was during Spring when we went. That time, there was a Wild Flower Exhibition and Spring Flower Festival was happening. The garden became more stunning with lush green and colorful spring flowers. Our visit to Garden of Morning Calm was an enjoyable start. Even it was raining, my brother and I had a great time exploring the place. It is a beautiful and relaxing garden with colorful flowerbeds and fascinating landscape. We went for lunch in one of the restaurants in Chuncheon-si after visiting the Garden of Morning Calm. We had Dak-galbi, a popular Korean dish made by stir-frying marinated diced chicken. Afterwards, we went to the most anticipated part of the tour, Nami Island. 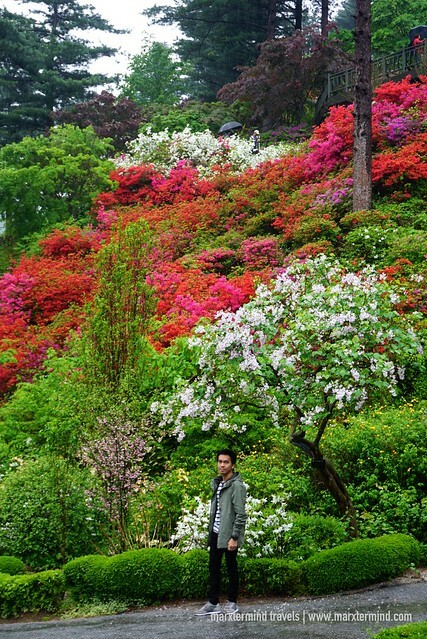 Famed for its romantic landscapes, Nami Island is one of the best tourist spots to visit outside of Seoul. It is a beautiful place with rows of majestic redwoods, ginkgo and pines, making it an ideal attraction for leisure walk. The island is also home to roaming deer, ostriches and various waterfowl. It also features interesting display of art and other photography exhibits. Guests visiting Nami Island need to buy tickets. Our driver took care of it for us already. When we had our tickets, we then lined up for the ferry ride. The island can be reached through a five-minute ferry ride. 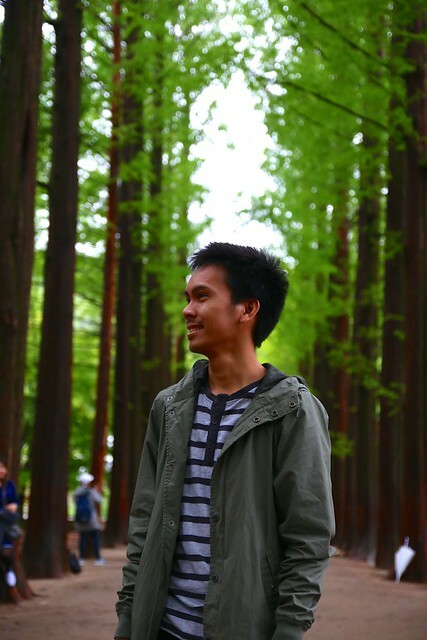 I couldn’t contain my excitement when we arrived at Nami Island. I was too excited to roam around and take photos. Our driver gave us two hours so my brother and I didn’t waste our time. We wanted to get to as much as many places so we started to walk around. Most of the walking paths in the island are surrounded by tall verdant trees. There are also beautiful grassy areas that are perfect for photo opportunities. The island also has several villages. Some of these that we were able to check out are Forest Village, Happiness Village and Love Village. 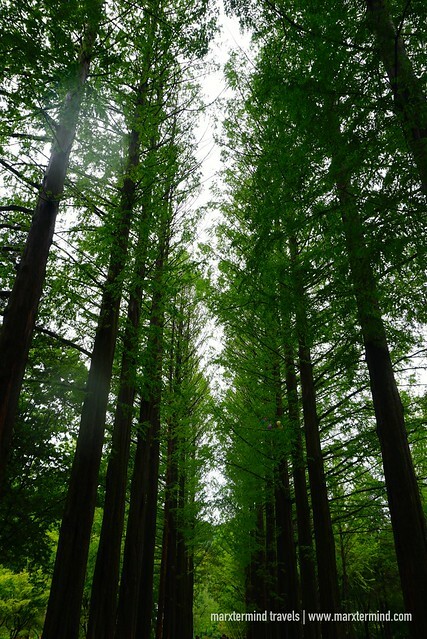 But the most picturesque spot that we visited in Nami Island is the Metasequoia Lane. This site has become a symbol of the island. The path is lined with giant redwood trees that offers a stunning scenery. Two hours wasn’t enough for us to cover everything. My brother and I still missed a lot of sites that makes me wanted to go back again. But even though we only had a few hours here, we certainly had a great experience. Nami Island island was really lovely with plenty of opportunities for photos. It was an amazing place with beautiful scenery. If you love nature and culture, you’ll definitely love this place. It was around 4:00pm when we paid a visit to Petite France. It’s a French-style theme park with lots to discover. We were given an hour to explore the place. It has colorful buildings with beautiful French architecture. 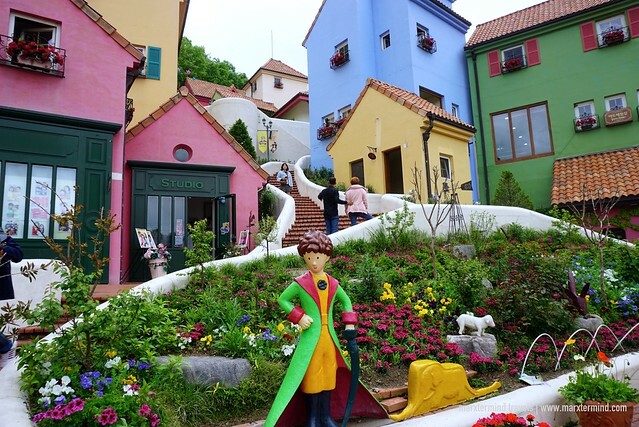 This French-inspired village also features traditional homes and a Little Prince gallery. Petite France also holds marionette shows. Other interesting attractions to see inside are Butterfly Park, European doll house, antiques flea market, traditional French house, Fountain Square, Pond de Fabre and “Bonjour” walkway. 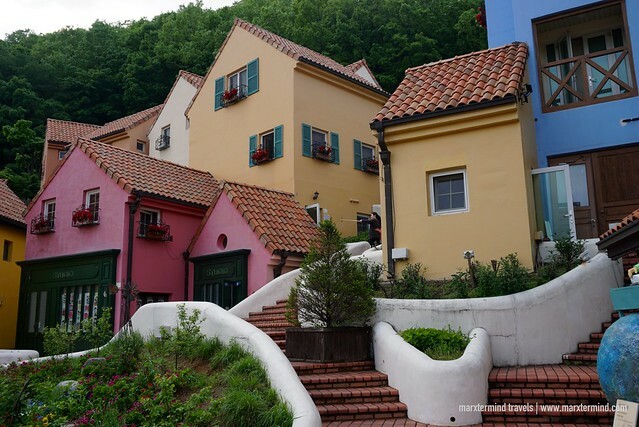 Petite France is also well-known for being a setting for Korean drama shows. Some of it are “My Love from The Star”, “Secret Garden” and “Beethoven Virus”. So if you’re a fan, you’ll definitely enjoy this place. 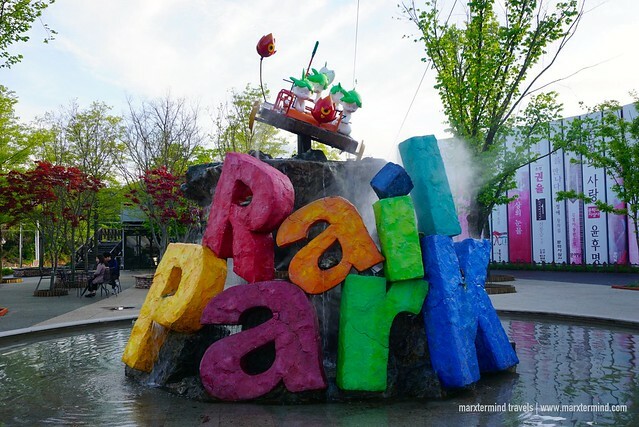 When I was still looking for a day trip to Nami Island, I was a bit hesitant if it would be worth it to include Gangchon Rail Park. I thought we wouldn’t have enough time to do this activity anymore. But since it is not often that we visit South Korea, I just decided to include Rail Bike when I booked our tour in Klook. 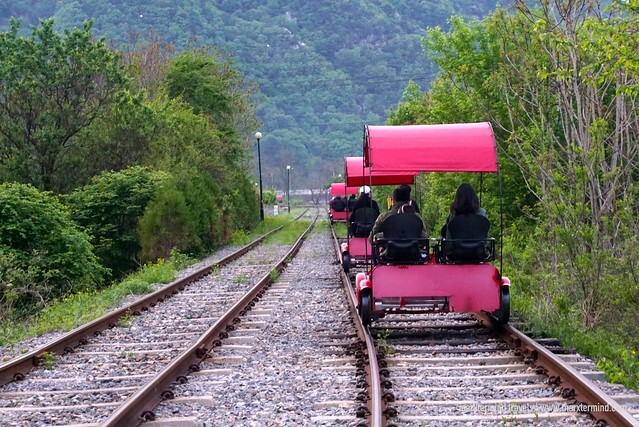 Built on the discontinued train line, Gangchon Rail Park is a popular tourist attraction where visitors can pedal along the old train track. Visitors can cycle through tunnels and see the lush countryside. It was quite interesting since it is only sometimes that I could experience biking through the rail. My brother and I were already tired from all the places that we visited that day but we were still able to enjoy this part of our tour. It was exciting with fantastic views. I was just glad that we included this activity. The entire activity took about an hour. It was already past 7:00pm when we were able to go back to the parking lot, where our driver was already waiting for us. We left the rail park and drove back to Seoul. Travel time is about two hours. We reached Myeongdong area around 9:00pm and there my brother and I had our late dinner. Our tour was an amazing day trip from Seoul. Booked through Klook, my brother and I had a very good experience with the tour. Despite that it was raining that day, our friendly driver made sure that we could visit and enjoy all the attractions. 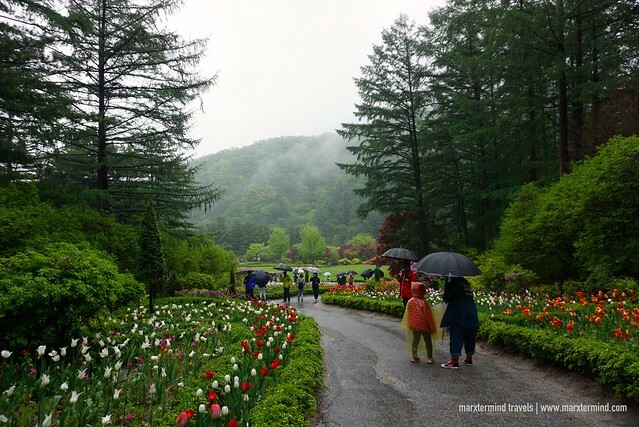 In one day we were able to visit four notable attractions such as Garden of Morning Calm, Nami Island, Petite France and Gangchon Rail Park. Discover and book amazing things to do at exclusive prices. Klook is your guide to tourist attractions, travel activities and local experiences around the world. Book tickets at the best prices anywhere and enjoy huge savings. Visit the official website or mobile app of Klook to book your next adventure.